Ephemeris for Monday, February 11th. Today the Sun will be up for 10 hours and 16 minutes, setting at 6:05, and it will rise tomorrow at 7:47. The Moon, 1 day before first quarter, will set at 12:57 tomorrow morning. 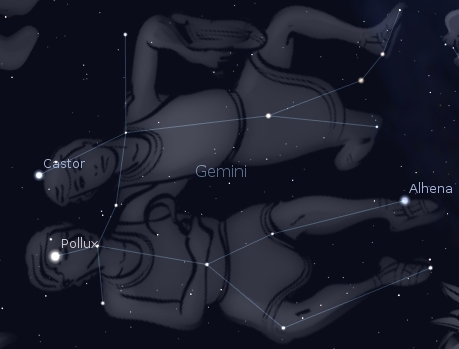 At 9 p.m. the constellation of Gemini the twins will be seen high in the southeast. The namesake stars of the two lads are the two bright stars at the top of the constellation. Pollux the pugilist, or boxer, is the lower of the two, while Castor, the horseman, is the other star, or rather a six star system. In telescopes two close stars may be seen each is a spectroscopic binary, meaning the lines of two stars can be seen in the spectrum. A faint nearby spectroscopic binary also belongs. Pollux, though a single star, does have at least one planet, over twice the mass of Jupiter orbiting the star at a distance somewhat greater than Mars is from the Sun. Pollux is 34 light years away while Castor is 50 light years away. Not too far away as stars go. Gemini with Castor and Pollux. Created with Stellarium. The Castor star system exploded in this JPL/NASA infographic.